I'm known as a player who puts a lot of backspin on the ball, but the fact is, I also know how to hit a shot that has almost no spin. This is a handy shot to have, particularly when you want the ball to sort of thud down and stop on the green. Outwardly the swing for this shot looks much the same as that for any other iron shot. 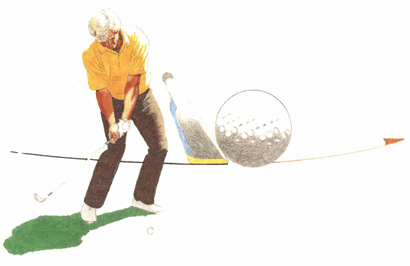 Your ball position should be a bit more forward - perhaps a half ball - than usual, but the differnence is in the way you feel during the swing. It's a loose and 'oily' feeling to borrow one of Sam Snead's words. Whereas on most shots you maintain a certain amount of tension in your legs, for this shot you unlock those muscles in your thighs and calves so that your swing flows wityh extra smoothness. Your knees don't fire as they do on other swings, and your leg action is soft and yielding. At impact, your club clips the ball with a 3-wood-like angle of attack, rather than the more downward blow that takes a divot.